"You can fly over a land forever; you may bomb it, atomize it, pulverize it and wipe it clean of life but if you desire to defend it, protect it, and keep it for civilization you must do this on the ground, the way the Roman Legions did, by putting your young men into the mud." The name Legio is coeval with the foundation of Rome, and always denoted a body of troops, which, although subdivided into several smaller bodies, was regarded as forming an organised whole. It cannot be held to have been equivalent to what we calla regiment, inasmuch as it contained troops of all arms, infantry, cavalry, and, when military engines were extensively employed, artillery also; it might thus, so far, be regarded as a complete army, but on the other hand the number of soldiers in a legion was fixed within certain limits, never much exceeding 6000, and hence when war was carried on upon a large scale, a single army, under the command of one general, frequently contained two, three, or more legions, besides a large number of auxiliaries of various denominations. The legion for many centuries was composed exclusively of Roman citizens. Around 390 BC, after the burning of Rome, the leaders of the Roman Empire had to develop new tactics to defeat unconventional attackers. The flexible tactics of the Roman Legion defeated the formidable Greek phalanx that until then had dominated the battlefield. The revolutionary effect of the Roman Legion on warfare is not disputed. As Rome sought to expand, she subdued the previously "invincible" Macedonian Phalanx using new tactics and organization against a tried-and-true army formation. These small units were built to travel fast and light, with many of the soldiers possessing skills in several specialties. They were highly successful in conquering armies throughout Europe and Africa, even when outnumbered. The history of the Roman legions is a very difficult subject. Vegetius, in his Epitome rei militaris writing in the third or fourth century AD, is hardly the best authority for the organization of Caesar's army. Changes of moment had certainly taken place between Caesar and Diocletian. Extensive changes were made by Augustus, Septimius Severus, and Diocletian. The intense feeling for the solidarity of the legion, to which Vegetius gave expression, was a creation of the Empire, and in Caesar's time that feeling was much weaker. The legions did not even receive names till the time of Augustus. The book, which is a confused and unscientific compilation, has to be used with great caution, but is none the less invaluable to the student of the ancient art of war. The first book is a plea for army reform, and vividly portrays the military decadence of the empire. The third contains a series of milita maxims which were (rightly enough, considerin the similarity in the military conditions of the two ages) the foundation of military learning for every European commander, from William the Silent to Frederick the Great. When the French Revolution and the “nation in arms" came into history, little more is heard of of Vegetius, whose maxims illustrated the principles of a war for limited political objects. The positioning of the legions of the Imperial Roman army provides a window into both the thinking and the course of events during the period from 30 BC to 300 AD. When one can identify the locations and date the redeployments of the legions, it is possible to recreate the planning that caused the army to be so placed. Redeployments, of necessity, shows a major shift of events or a significant refocussing of the strategic thinking of the then ruling emperor at that particular moment. This book starts from the assumption that a legion's headquarters remained at a base until that legion was permanently posted to another base. A legion might temporarily serve in another province, even for more than a year, perhaps with its eagle present, but know that it would return to its permanent base. At any moment in time, a legion might have detachments serving in a variety of locations. Some of these detachments, or vexillations, might be separated from the parent legion for long periods of time at great distances from its permanent headquarters. A great number of scholars have addressed the subject of legion locations, usually one legion or one province at a time. Before the military reorganization of Marius in 649 AUC (104 BC), the Roman army went through three phases of development, with the legion reduced from 8400 men to 4000. During the late empire, a legion only consisted of perhaps 1,000 men in the mobile field deployment and around 3,000 men in the territorial legions. The ancient Roman legions carried standards in the shape of eagles and were awarded "nicknames" to commemorate distinguished service. In 58 BC, Caesar had six legions, eight in 58-57 B. C., and ten in 53 B. C. All legions, like our divisions, were numbered according to date of enlistment and, in the time of the Empire, received in addition distinguishing names such as Victrix. Legio Decima Equitata, the Tenth Legion of Julius Ceasar, was not the same unit as Legio X Fretensis, which was reported to have been officially formed sometime during 712 or 713 AUC (41 to 40 BC) by Octavian. Legio X Fretensis derived its name from the Fretum Siculum, which is the water channel located between Italy and Sicily, now called the Straits of Messina. By 759 AUC (6 AD) Legio X had made Syria its home base, along with the Legio III Gallica, Legio VI Ferrata, and Legio XII Fulminata. Nearby in Egypt two additional legions were stationed. They were the Legio III Cyrenaica, and Legio XXII Deiotariana. Among their many duties of maintaining the peace in this volatile area was the vital protection of the corn supply being exported to Rome. Legion X Fretensis, which took part in the siege of Jerusalem and Masada, garrisoned Jerusalem for nearly 200 years. After the battle of Actium, Augustus was master of two armies, his own and Antony's. These were in more than two divisions, in each of which the leg1ons were numbered in order I., II., III., etc. For those which he did not disband (viz. 12 of his own and 6 of Antony's) he kept the old numbers, adding to each a distinctive name, e.g., Legio III. Augusta, Legio III. Cyrenaica, Legio III. Gallica: Leg. VI. Victrix, Leg. VI. Ferrata. This custom was retained even when new legions were raised, so that, besides the Legio I. Germanica raised by Augustus, later emperors enrolled also Legio I. Adjutrix, Leg. I. Italica, Leg. I. Minervia, Leg. I. Parthica, and so on with other numbers. The XVIIth, XVIIIth, and XlXth legions were destroyed (under Varus) by the Germans in A.d. 9. These numbers were never afterwards replaced. Similarly Legio IX. Hispana was exterminated by the Britons in A.d. 120, and never was restored. 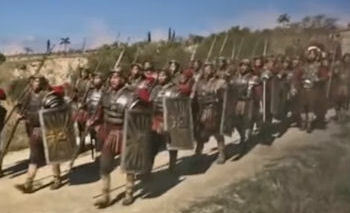 Augustus left, at his death, a standing army of 25 legions. Tacitus relates that at the reign of Tiberius in the seas that on each side wash the coast of Italy, two fleets were stationed; one at Misenum, the other at Ravenna. The maritime parts of Gaul, adjacent to Italy, were guarded by the large galleys, which were taken at the battle of Actium, and sent by Augustus to Forojulium, well provided with able seamen. But the chief strength of the empire was on the Rhine, consisting of eight legions, to bridle at once the Germans and the Gauls. Spain, lately subdued, was held in subjection by three legions. Juba reigned in Mauritania, deriving his title from the favor of Rome. The rest of Africa was kept in awe by two legions. A like number served in Egypt. In that vast extent of country, which stretches from Syria to the Euphrates, bordering on the confines of Iberia, Albania, and other states under the protection of the Roman arms, four legions maintained the rights of the empire. Thrace was governed by Rhasmetalces and the sons of Cotys. The banks of the Danube were secured by four legions, two to Pannonia, and two in Maesia. Two more were stationed in Dalmatia, in a situation, if war broke out at their back, to support the other legions; or if a sudden emergence required their presence, ready to advance by rapid marches into Italy. Trajan's campaign against the Parthians expanded the Roman Empire to its greatest extent. After Trajan's death in 870 AUC (117 AD), the new emperor, Hadrian, made defensive moves to protect the existing Roman Empire. Roman legions actually withdrew from the regions across the Danube later in the Second Century AD. 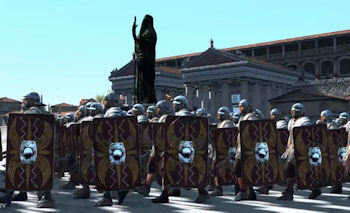 By this time, the Roman Army consisted of about 28 Legions with approximately 160,000 legionaries, along with an additional force of some 220,000 auxiliary troops in other types of units. Augustus had inherited some 60 legions after the battle of Actium (31 BC) but soon reduced this to 28 (c.150,000 men) in the interests of political security and economy. The military establishment of Augustus ultimately consisted of twenty-five legions. Rome at the same time had her own peculiar forces, namely, three city cohorts and nine of the praetorian bands raised for the most part in Etruria, Umbria, ancient Latium, and the colonies of the republic. To this national strength must be added the naval armaments of the allies, placed at proper stations, together with their infantry and cavalry, forming, in the whole, a body of troops, not inferior in number to the Roman army. But of the foreign auxiliaries it is impossible to speak with precision. They were shifted from place to place, with numbers now augmented, and now reduced, as occasion required; and, by consequence, an accurate estimate can not be expected. As for the distribution of the troops, Gibbon arrived at his statement by combining what Tacitus tells of the reign of Tiberius, and what Dion Cassius tells of the reign of Alexander Severus ; always a doubtful method of procedure, and in this case demonstrably leading to erroneous results. Under Tiberius in 23 AD there were four legions in Upper Germany, four in Lower Germany, three in Spain, two in Egypt, four in Syria, two in Pannonia, two in Dalmatia, two in Moesia, two temporarily removed from Pannonia to Africa. New legions were created by Claudius, Nero, Domitian, &c.; on the other hand, some of the old legions disappeared, or their names were changed. Three new legions (I, II, and III Partbiea) were instituted by Septimius Severus. Each legion had a special name, thirty in number) in the time of Marcus Aurelius. The dining-in as a military tradition has its roots in the shadow of antiquity. The pre-Christ Roman Legions probably began the dining-in tradition. Roman military commanders frequently held great banquets to honor individuals and units. These gatherings were victory celebrations during which past feats were remembered and the booty of recent conquests was paraded. The Change of Command Ceremony is deeply rooted in the military tradition. Some of its aspects date back to the Roman Legions when the baton of command was presented to a newly designated commander. The ceremony itself symbolizes, in graphic form, passing the responsibilities of command and maintaining an unbroken succession of command far a particular unit. During the chain of command, the senior enlisted soldier presents the colors to the outgoing commander to symbolize the function of entrusted leadership each commander has; responsibility for the soldiers of the unit. The outgoing commander the "surrenders" the unit colors to the senior officer. In this action, the outgoing commander publicly relinquishes his command of the unit to a senior officer. The senior officer, in the name of the higher headquarters, receives the colors and passes them to the incoming commander. By taking the unit colors, the incoming commander signifies his willingness to accept responsibility of the unit, its missions, and its soldiers. The incoming commander then passes the unit colors to the senior enlisted soldier to symbolically state his acceptance and reliance on the soldiers of the command. The flag used in the Change of Command Ceremony represents a portion of the unit's history. The flag itself can be traced to the legion standards carried by the Romans as well as standards carried by armies throughout military history. The flag represents the history of the unit itself and caries the battle streamers won by the unit in combat. Where and when possible, the flag is one actually carried by the unit into combat.